This Cozy 2 bedroom, 2 bathroom Classic La Jolla Cottage is perched above the Village in the prestigious Country Club area of La Jolla. Enjoy spectacular OCEAN VIEWS from the large modern kitchen, one bedroom, and from the large picture window in the living room. 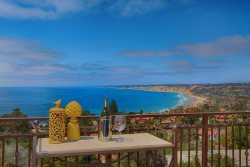 Take in the north Shore Ocean views all the way to Del Mar, from the expansive ocean view terrace, with a very comfortable conversation area, fire pit and a top of the line Bar-B-Que grill for entertaining. This home has all the charm of olde La Jolla with all the amenities and comforts one would expect in a luxury La Jolla vacation home including satellite TV, WIFI, fully equipped kitchen and very comfortable furnishings throughout. Available weekly and monthly year round. Prices vary by season.